I'm 21 months younger, 1.5" taller and a shade of blonde lighter than my older sister – yet people have often asked if we're twins. You've probably met some lookalike siblings yourself... or even a pair or two of actual twins. It once took me 6 months to differentiate between a set of identical brothers! When owning a business, it's imperative to stand out! Generic won't cut it. Run-of-the-mill won't cut it. Twinning won't cut it. While going through my brand redesign process, I conducted a ton of research into other designers' websites and styles. Yes, I was spying on my competition (which you should totally try sometime). 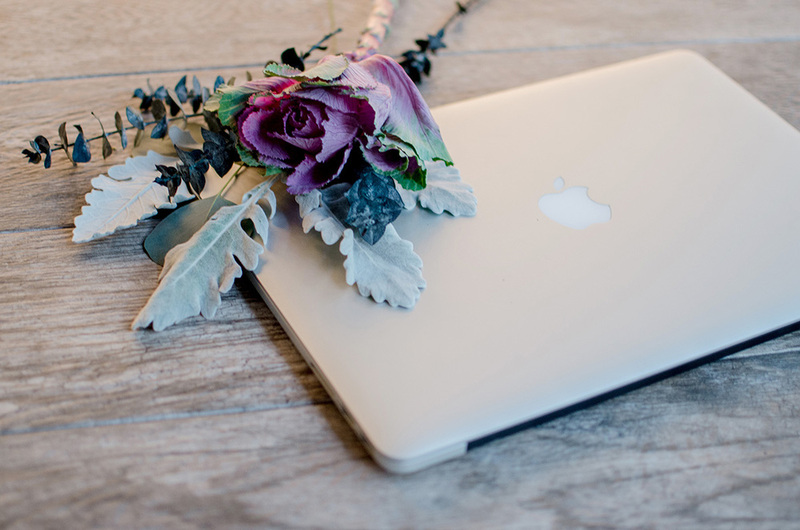 Within the first few minutes of my research, I opened a site with a beautiful header image – a crisp white desk flaunting a flawless iMac, surrounded by adorable accessories like a gold pear, black & pink polka dot notebooks, a shiny gold stapler, and a vase with pink flowers. What's that – you've seen that photo before? I'm not surprised. I ended up seeing it three more times throughout the next hour on different designers' sites. Not just a similar image... the exact. same. image. I've been looking all day for the perfect designer. I want someone unique and creative that'll leave me breathless over how custom and distinct my designs are. I've been through thousands of websites, most of which have wonderful portfolios. How will I ever decide which one to hire? I guess I'll do it House Hunters style – start by eliminating the misfits and outliers. Well, these four all look exactly the same, so I can't remember which one had the best portfolio, and how can I trust that they'll design something unique if their own website isn't unique? They're out. Just like that, you lost a potential favorite client. And possibly countless others. This, ladies and gentlemen, is why I am an advocate for custom brand photos. Whether you like it or not, we live in an overly visual world. Facebook, Twitter, Instagram, Pinterest – thousands of graphics pass through our pupils each day. You don't just want to stand out, you need to stand out! Custom photos ensure that you're not just another fish in the sea — you're a freakin' mermaid... the one clients are raving over and your competition is jealous of. Now I'm not a photographer and get no benefit from convincing you to take or purchase custom images for your branding. I'm just a fellow small business owner who cares to see you succeed (and am passionate about pretty pictures and killer branding). I spent about $300 on accessories and flowers for my brand photoshoot. Lauren, that doesn't quite sound like saving money! While it was an investment up front, I ended up with around 1000 usable photos, which provides me with about 3 years worth of images before they start feeling overused. If I were to purchase photos as-needed from stock photo sites, I'd be spending about $10-30 per image, costing me a total of $10,000 - $30,000 – YIKES! I could easily whisk away an entire day just looking for the perfect image for a client's graphic. But for my own brand images, I just open my folder, grab one that works, plug in my text and I'm good to go. Time is money, so that's a huge win! First impressions are huge, and you want the images of your brand to be embedded in your clients' memories! With custom photos, taken just for your brand, you have the opportunity to look new, fresh and unique. Consistency is key. By using stock photos from the same source, whether you take them yourself or hire a professional, you'll develop a cohesive look. Your photos will have intention and impact. Strong brands are built on consistent visuals and messaging. Let your photos work for you, not against you! Why settle for something mediocre when you could be packed with personality?! My favorite TV show is "Fixer Upper," which I pulled inspiration from for my branding. Coach Reina Pomeroy recently complemented my site saying, "It reminds me of a really beautiful modern home that you see on HGTV. Like you just want to buy it straight off of the show. It feels like there's so much hope and joy!" I wouldn't get that same response using generic & mismatched photos. If you're camera savvy and are good with editing programs, you can take professional photos yourself (like I did). However, if you question your abilities or don't have proper equipment and editing software, I'd leave this task to the pros. They'll provide you with high-quality images that have good lighting and perfect composition, to give you the utmost professional presence. Your imagery should speak directly to your clients, therefore it should be created specifically with them in mind. We touched base with some successful brands that provide (or utilize) custom brand photography to gain insight into why they think this original content is so important. Click a brand name to visit their website. Why is Brand Photography Important? Beautiful imagery is the best way to attract and retain a community. I focus on highly styled imagery to be shared on the web and especially on social media - a touch point that a lot of brands work with. Social media should be an extension of your brand just as much as your website, it's the perfect portfolio. How Would You Describe Your Brand Photography? Bright, fun, happy, colorful, high contrast, artful. They're design-lovers, they appreciate art, they love to be inspired. Photography is one of the most important things about your brand! It represents your unique voice in a visual way that appeals to and attracts your target audience. My brand photo style is clean, bright, fun and unique. I love creating distinctive photos and consider my photography an extension of your business and brand. We work together so I can really understand your vision and make that vision come to life through your photos. Ideal clients are those that have a good sense of their brand and their business, have a niche, and a really good idea of who their target audience is. That way, it is easy for me as a photographer to create photos that really represent their brand and resonate with their target audience. I want people to see things that are fresh - I know I don't really feel inspired when I see three business owners using the same stock photo. I use my custom photography on Instagram, I love being able to share fresh content that looks different from anything else I've worked on or showcased before. My custom shots also tend to get the highest engagement on Instagram as well, versus when I use stock photography. My brand photo style is bright white, lots of negative space, influenced by my brand. LE Consulting is all about travel and lemons, so you'll see a lot of those inspirations throughout the photos I use/purchase. Who Took Your Brand Photos? I have purchased branded photos from Think Creative Collective and TwigyPosts. While stock photos are pretty, they aren't unique and don't show off your personality. Custom stock does. It's made just for you and matches your style guide to keep consistent with your branding. Very girly (pink & gold are favorites) but as with custom work, I can change my style to fit my clients needs. I like to have lots of fun items in my photos and have different moods. My specialties are Etsy banners and Mac desktop mockups. I love working with people who know what they want and are excited throughout the process. They understand the importance of the images and a general concept of branding. To tell your STORY! Many of us are in industries that are saturated and a sea of sameness, custom brand photography allows us to communicate our unique message, our platform, our passions, our values - our story. Real, colorful, emotive, connective, vibrant, dynamic. Creative, passionate women entrepreneurs who have been in business for 2+ years and have seen success. They are ready to up level and stand out in their industries. People are very emotional - just look at the advertising industry. They sell us trillions of dollars worth of products, some we need, some we don't, based off of how they make us feel. Images with a unique brand aesthetic or vibe evokes emotion, usually targeted to how YOU want your clients to feel when they look at it. I want my images to be timeless, classic and true-to-life. I want to communicate a sense of luxury. My ideal client is someone who knows exactly who their target market is. What they do, where they live, what they love doing. They know how they want their clients to feel when they enter their site or receive their collateral. They know the "deep why" of what they do, and through that, I can help create imagery that appeals to that audience and helps connect them to the people they should be working with. There are some awesome brands listed above, but if you're a photography-lover like me and want to take your own pics, jump over to this post!